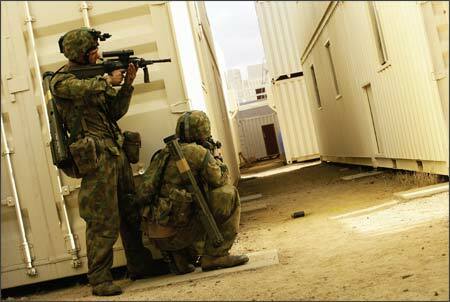 The planned equipment within Phase 2B of Land 125, Australia’s soldier modernisation programme (SMP) is now acquired. This consists of the Selex Personal Role Radio, enhanced combat helmet, personal protective padding for the knees and elbows, Individual Combat Load Carriage Equipment - known colloquially as ‘Icicle’ and the Thermal Weapon Sight, the Qioptiq VIPR2, carried at the section level. Preparatory work for Phase 3 is well under way and, at the end of the year, the Australian Government is due to consider the first of the sub-phases for approval, allowing the project office to commence the acquisition phase of the system. The system being considered within this phase of Land 125 is the Battle Management System - Dismounted (BMS-D), Phase 4, likely to be tasked with achieving an integrated soldier system, will not be considered for initial approval before the middle of 2010. Initially separate, Australia has opted to align their mounted and dismounted BMS requirements, producing a common system with common software and training using the same software. In regards to the lethality element, a contract has been let with Thales Australia to undertake design changes to the weapon will allow it to continue in service until at least 2030. Users of the BMS will be issued with a monocular and tablet display with secure Type 1 data, communicated through the command chain via the wideband Raytheon Microlight radio carried at platoon HQ level and narrowband Harris AN/PRC-152 at section and team leader level. The system will be integrated with current body armour and load carriage. The Land 125 team are currently doing some in-house investigation for integration and this is currently in the hands of a small team of soldiers lead by a Warrant Officer to refine the ergonomics of the design. The three broad parts of the lethality component of Land 125 are to develop or redesign the Austeyr F88 rifle so that it has an open architecture, embedded interoperability in terms of the ammunition and to investigate new technologies to enhance it as a tool of the rifleman. There are four planned variants for this weapon system; standard, commander, marksman and a grenadier. A preliminary design review for the new F88 took place in March 2009. The design features a new modular open architecture with an embedded electronic architecture, steel “super rail” for an under barrel grenade launcher while retaining the current floating barrel design. The final design has yet to be finalised but it is likely to house the power supply in the stock which will be connected to the rail. Lt. Col. Mattey also emphasised the enduring need for security in the system, an issue that currently precludes the effective substitution of wireless links for cabling on the soldier. A balance is also being sought in terms of the degree of integration with vehicles, both as a source of power supply and a means of access to external communication and applications, not to mention the potential for stowage of what would otherwise have to be carried on foot by soldiers.